SU Podium and more > Categories > Main Messages Board > [Help] Why doesn't Podium show my Sketchup model ? I posted this question on reddit before, and they advised me to pop the question here. 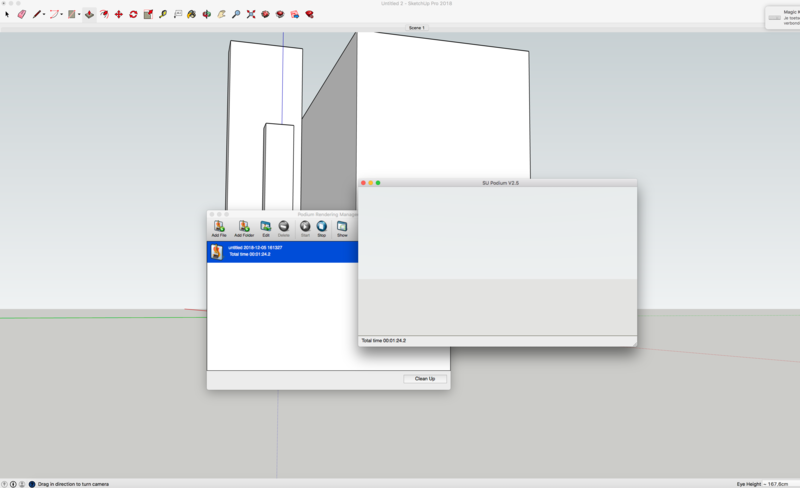 I am using SketchUp Pro at my work office. When I try to render my model in Podium (V2,5 plus), it only shows the horizon and the sky. It doesn't show my model, no matter from what angle I look at it. I tried it in a different file with just some random shapes (picture); but it has the same result. What could I be doing wrong ? Note: my coworker uses the same programs and on her computer it DOES work. We both work on an apple computer. This is interesting - there are only a few simple elements there - it ought to work. Can your coworker render this model from this viewpoint? This will tell us whether there is something weird in the model, or something weird with your installation. Do you have any other plugins installed? There are conflicts with some. You aren't by any chance using the Advanced Camera Tools plugin are you? Podium doesn't support this.